If ongoing change in ecosystems and society can render inflexible policies obsolete, then management must dynamically adapt as a counter to perennial uncertainty. This chapter describes a general synthesis of how to make decision-making more adaptive and then explores the barriers to learning in management. We then describe how one such process, known as adaptive management (AM), has been applied in different river basins, on which basis we discuss AM’s strengths and limitations in various resource management contexts. Understanding and managing rivers demands much more than it did in the past. For centuries conventional engineering and economics oversimplified the challenge with assumptions of stability and stationarity (Milly et al. 2007). Despite vast increases in technical capacity, current management strategies cannot provide durable solutions to crises like more intense and frequent floods and droughts (Gleick 2004; Pahl-Wostl 2007; Huntjens et al. 2011; World Water Development Report 2009). Efforts to address intensifying trends of such crises revealed that our perspectives must expand along at least two dimensions. First, we must broaden our vision horizontally with perspectives from across society. No single lens can reveal all the causes and possible cures for such problems. Management should become more inclusive and integrate multiple perspectives from academic disciplines with the shifting expectations from society. Our vision must extend out beyond engineering and economics and even the natural sciences to include insights from the social sciences and bridge the disciplines (interdisciplinary). This expanding perspective now sees riverine communities as social-ecological systems (SES) to reflect a broader focus on critical interactions within and between the domains of engineering, ecology, economics, and social sciences (Sendzimir et al. 2008). However, decision-making needs to expand further and become transdisciplinary, embracing experience from all across society, including business, and governmental and nongovernmental organizations. Drawing from such a wide horizon, we can more completely define problems, probe for solutions, and be confident that our policies are acceptable to all sectors of society. Second, we must extend our vision vertically to include all the levels at which management issues occur. Part of our uncertainty arises because the scales at which problems emerge and solutions might be found shift and expand. What had been local problems that responded to simply switching populations or resources now appear at broader scales, e.g. catchments, basins, and continents, globally (Allen et al. 2011). This scale challenge demands a perspective that can account for all the levels as well as how some problems can jump levels under extreme circumstances, and these influences can move either up or down the chain. Some managers frame all problems within the boundaries of their administration. Problems that spring from over the horizon and cross those boundaries can prove to be catastrophic surprises. Surprises can emerge “from below,” when the effects of local processes accumulate into something that encompasses the whole landscape or the region. For example, increases in local surface runoff from overdevelopment of fields and forests can aggregate up to massive erosion and flooding problems at larger scales. On the other hand, natural and human communities along rivers are increasingly vulnerable “from above” to global variability in climate, politics, or finance. Addressing such uncertainty with authority from larger (EU, national) scales can often increase uncertainty in governance. As the scale of accountability expands from individual river valleys to basins and beyond, managers must navigate increasing institutional complexity arising from overlapping administrations at different levels across each basin. Managers increasingly must adapt to this institutional complexity since almost half the earth’s land surface is covered by some 260 transboundary river basins (Wolf et al. 1999), and that complexity is amplified when global processes cross those boundaries. Systems like riverine SES are complex in structure, and that complexity is compounded by their dynamism as unforeseen consequences of policies and management are becoming apparent. Initial success at restoring ecosystem integrity often cannot be sustained (Scheffer 2004), and the system reverts to an undesirable state. So often have initial policy successes collapsed and remained so, despite all efforts at restoration, that the dysfunctional inertia following these surprising reversals has come to be known as policy resistance (Sterman 1994, 2000). Attempts to control disturbances (flood, fire, and pests) have often led to larger and more profound disruptions (Holling 1978). In riverine SES, for example, policies to constrain flood volumes within channels bounded by dikes result either in increased crop damages due to water stagnation (see Chap. 28) or in larger flood volumes moving faster when dikes do fail. As a result, the trend of increasing flood damages continues to rise (Sendzimir et al. 2007; Gleick 2004; Pahl-Wostl et al. 2007). Conventional management policies have been aimed to “control” river dynamism (Poff et al. 1997) to achieve water security (sensu Cook and Bakker 2012) but at the expense of losing ecosystem services (Nilsson et al. 2005; Palmer et al. 2008; Vörösmarty et al. 2010). Most rivers are already over-allocated and stressed by the impacts of control (dams, diversions, etc.) to meet rising social demands for services (Chen et al. 2015). The paradox is that reducing river dynamism yields short-term economic gain and security from extreme events (flood, drought), but it shrinks the range of options for managing all the economic and ecological functions that make a river basin resilient to uncertainty over the long run (see Chap. 28). Rising variability of large-scale drivers such as climate, population, or finance may overwhelm such narrow, exploitative management approaches, raising a mandate for more flexible and adaptive policies (Medema et al. 2008). However, transition to a more flexible management regime may be blocked by previous decisions that locked management onto a path of defensive and inflexible policies and technologies. When the scope of current decisions is confined to a narrow path defined by previous ones, this is known as path dependence. For example, massive investments in static strategies based on dams and dikes have established a concrete development path bounded by mental and technical walls that choke off innovation. First, they set a historic precedent that makes it difficult to even imagine more flexible ways to manage water. Second, they have monopolized the financial and policy resources of government, denying support for future management experiments to explore new ways to adapt to change. Experimentation is further blocked by a sense of hopelessness when path dependence on short-term control gives rise to policy resistance in the long term. These possibilities have driven experimentation to integrate science and policy in one decision-making process. Policy in this sense refers to the policy formulation process. Policy is formulated as management interventions in the short to midterm to explore and refine different strategies with an eye to developing long-term policies (administrative) and even legislation. If ongoing change in ecosystems and society can render inflexible policies obsolete, then management must dynamically adapt as a counter to perennial uncertainty. This chapter describes a general synthesis of how to make decision-making more adaptive and then explores the barriers to learning in management. We then describe how one such process, known as adaptive management (AM), has been applied in different river basins, on which basis we discuss AM’s strengths and limitations in various resource management contexts. Adapting to and managing change requires the sustained capacity to learn and to flexibly manage. Over the past century, these challenges have been independently recognized and addressed in a variety of disciplines and contexts. Similar but separate experimental lineages have tried to make decision-making more adaptive in, e.g., business (Vennix 1999; Senge 1990; Checkland 2000), policy (Toth 1988; Sabatier 2006), and natural resource management (Holling 1978; Walters 1986; Gunderson et al. 1995), to name but a few. 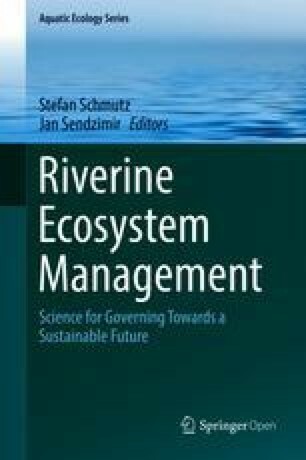 This chapter describes principles common to many approaches and focuses on adaptive management of natural resources for its application to river management. The move to make management adaptive starts with the recognition that uncertainty is inevitable in an evolving world. If “nature” and “society” never stop changing, then reality is always several steps ahead of what we know, and certainty is a dangerous trap. Uncertainty from unprecedented scales, e.g., global climate, is daunting, but inaction is not an option, and ignorance is not an excuse. We cannot postpone management actions until “enough” information is available (Richter et al. 2006). We must manage even as we learn how, which means “learning while doing.” Four kinds of uncertainty confront a manager: environmental variability, partial observability (e.g., ambiguity about resource status), partial controllability (e.g., ambiguity about how policy is implemented), and structural or process uncertainty (e.g., ambiguity about what causal relations produce the resource trends of concern) (Williams 2011). Given that change never ceases, the older goal of control that eliminates uncertainty has been replaced by the adaptive vision of reducing uncertainty as much as possible through sustained learning. One can argue that all forms of management involve learning. However, the history of management experiments that failed because learning was too haphazard (e.g., unstructured trial and error) has driven generations of experiments in how to formally structure that learning such that management policy, science, and local practice advance knowledge together. Starting after World War II a series of sudden, irreversible collapses in fisheries, agriculture, rangeland grazing, and forestry forced natural scientists to recognize how strategies to eliminate uncertainty may produce deeper crises (Beverton and Holt 1957; Holling 1978). Failures to reverse or even explain these collapses may provoke even more profound uncertainty and highlighted the need to learn even as restoration efforts continued. This hard experience suggested that learning to reduce uncertainty was a much more achievable and practical goal than eliminating uncertainty, though other goals can be pursued at the same time, e.g., stabilizing and restoring ecosystem functions and services, to name but one. Adaptive management (AM) emerged from these resource collapse crises as one lineage of experiments started by Holling (1978) to integrate policy and science in a cycle of learning (Fig. 16.1). This process structures learning into four phases and iteratively integrates a series of linked processes in which we modify assessment, policy formulation, implementation, and monitoring in order to track and manage change in the world (Walters 1986; Magnuszewski et al. 2005). The assessment process highlights uncertainties in societal goals. Policies are formulated as hypotheses that test those uncertainties. Management actions can be used to test uncertainties, along with achieving other societal objectives. Monitoring the consequences of actions leads to an evaluative effort, which can be used to adjust or reaffirm policies. AM has burgeoned into many forms, some of them fully institutionalized, such as the implementation of the Water Framework Directive in Europe. However, we confine our description of AM to one of its most fundamental forms to highlight the most essential elements in its basic structure (for a more detailed survey, see Allen et al. 2011). The AM process starts with the assembly of a team of a size range (e.g., not more than 25, 20 is better) that is big enough to encompass a diversity of perspectives but not so large that discussion becomes unmanageable. Efforts to increase diversity have invited participation from natural and social scientists, as well as key actors in the business, policy, and administration sectors. Special benefit has been gained by including local practitioners (e.g., fishermen, hunters, environmental activists) whose unique experience (often over time spans much longer than most science research projects) can raise vital questions and add practical insights to the discussion. The challenge is to achieve the right balance between power and perspective. That means including the key actors that have real power to affect the outcome of any decision as well as a range of practitioners with the sufficient experience and training to provide a healthy diversity of perspectives. Insufficient diversity means that no breakthrough innovation may occur due to lack of key alternative analysis or policies. Insufficient power means that any gains in understanding may not be realized in practice. In its simplest form, the AM learning cycle starts with an assessment phase wherein stakeholders explore a range of assumptions in order to formulate a suite of hypotheses that provide separate predictions of why the problem in question occurs (Walters 1986; Gunderson et al. 1995). Within this phase participants can articulate different objectives, identify both alternative strategies or policies for management and their consequences, and recognize the key uncertainties that remain even as, in later phases, we monitor the consequences of our policies (Williams 2011). Modeling can serve as a useful exercise for participating stakeholders to define and bound the problem and examine the key variables and interactions they consider crucial to the dynamics of resilience and vulnerability in the system. Modeling can be done to explore assumptions about the structure of causal relations (conceptual models) or the dynamic implications of those assumptions (mathematical simulation), in explaining how the problem trend occurs. Further, stakeholders can collaborate in role-playing games to simulate the social relationships that may be key to the management problem and/or its solution. In the assessment phase, stakeholders winnow down their list of important hypotheses to one or two key questions to investigate for causes and solutions of the problem of concern. The following phases use those questions as a base on which to formulate (policy formulation) and then implement policies (management actions) that test those questions. While conventional management focused policy on solutions, AM first designs policy that tests the most useful questions with the expectation that the results will eventually produce more durable solutions. The monitoring and evaluation phase uses those questions and the indicators and thresholds derived therefrom, to survey and document how the system responds to these policies. Eventually the lessons gained from that survey data will be used when management recognizes that the objectives were not achieved or the world, e.g., boundary conditions, has changed sufficiently to merit starting the whole process again. A new learning cycle will begin with an assessment phase to reexamine and perhaps redefine the problem, the management goals, the underlying assumptions about causal relations, etc. Ideally AM would transcend the boundaries on learning placed by budgets (project timelines), and politics (election cycles), and periodically revive the process to keep our science and policy in step with how the world is changing. The European Union implements such a strategy by reviewing river management plans every 6 years under the aegis of the Water Framework Directive. Management may serve to ameliorate threatening change, but because of path dependence innovations in management can be blocked as another kind of unwelcome change. There are many reasons why the AM process has not succeeded either in being attempted, sustained, or adopted by communities and/or governance agencies. Understanding these barriers may catalyze better experiments to improve AM in concept and practice. We first describe these barriers to AM in general and then consider refinements to integrate AM better in the policy world and conclude by examining specific barriers to different phases of the AM cycle. AM can appear as a complex and intimidating challenge to any manager or agency considering to apply it. To start with, its very flexibility has engendered so many interpretations that no single model appears as a tested example (Fontaine 2011). Secondly, previous experiments on North American rivers, e.g., the Columbia River basin, the Colorado River in the Grand Canyon, the Everglades, and the Sacramento-San Joaquin river basin and delta in California (Johnson 1999), have proven very costly in terms of time and money invested as well as the institutional complexities that had to be harmonized (Richter et al. 2006). In these cases the process entailed multiple layers (executive, manager, and technical) of decision and review (Walters et al. 2000) and was agitated by the levels of sociopolitical controversy surrounding the significant economic trade-offs at hand (Richter et al. 2006). If success requires years of sustaining such effort, many might opt for less costly approaches. Finally, despite some exceptions (Allan and Stankey 2009), there are few, convincing success stories in AM’s history of risky and costly experiments (Lee 1999; Medema et al. 2008). One reason may be that often success is hard to detect when clear thresholds are difficult to establish and measure (van Wilgen and Biggs 2011), though adaptive learning successfully developed flow thresholds on the Letaba (Pollard et al. 2009) and Kissimmee (Toth et al. 1998) rivers. Another reason is that no history of successfully repeated experiments can be built on the basis of contradictory definitions or applications of AM (Allen et al. 2011). The slow adoption of AM can broadly be explained by path dependence on conventional, control-centered management strategies. A variety of factors can contribute to this: funding and administrative priorities based on reactive rather than proactive management paradigms (Walters 1997), failure to identify or address the potential to shift goals to acknowledge the increased risk of surprise because of social sources of uncertainty (Tyre and Michaels 2011), defaulting to extant institutional norms rather than reflecting, box-ticking as opposed to learning and favoring competition over cooperation (Allan and Curtis 2005), and resource limitations in terms of funding and human capital. The novel capacities that AM requires of any river manager would be a major barrier to adoption. These capacities include developing new ways for managers and stakeholders to collaborate under high uncertainty, especially in integrating science and policy in participatory processes, considering a wide range of practices over long time periods projected in future scenarios (Pahl-Wostl et al. 2007). As opposed to direct administration of agency employees, managers might have to patiently attend to repeated phases of social learning by the community in implementing and then sustaining new and innovative management approaches (Pahl-Wostl et al. 2007). AM began as an initiative by natural scientists to integrate policy and science by inviting policy makers, managers, and local practitioners to share the risk of raising good hypotheses by blending their experience to confront the multiple issues in these complex systems. In turn, the AM process encourages scientists to share the risk of formulating credible policy that really sustains SES. Many perspectives from both sides have motivated and informed experiments to improve AM. Policy makers in general found the core AM cycle (Fig. 16.1) far too simple in its appreciation of the diverse influences that create the policy world in which they operate (Walters 1997). For example, Weick (1995) claims that a key challenge to adopting and implementing AM is that the basic concept may aim for the key management goal, but it does not give enough attention to one of the founding tenets of AM: the diversity of perspectives and goals among stakeholders. Many of them are driven by very different goals, which are tied to politics, business lobbying, or ideological stance and which are in turn linked with broader organizational and social contexts. Understanding these interactions is critical to a successful application of AM. Innovators in business management reached the same conclusion as government policy makers: the science of trends and causal mechanisms is critical to identify potential paths and related causes, but it must be complemented by appreciation of the most powerful factors that drive those causes and trends, e.g., the goals, paradigms, and mental models that drive the stakeholders (Senge 1990). Paradigms and mental models are like archetypes or basic templates of how we see the world, and we use them to filter information into categories like true or false and believable or incredible. For example, some see the world as a collection of individuals, whereas others see a hierarchical structure of power relations that connects everyone (see Kahan 2008; Yazdanpanah et al. 2014). The structure of relationships and the trends they generate arise out of these goals and mental models of society. How we interact and how those relations generate trends depend on how we think. How we think and what goals we use can be changed as part of the decision-making process. AM has been applied to foster this by creating a space that’s safe to reveal our underlying thoughts and open the door for innovative compromises in thinking, policy, and action. Efforts to make business organizations more adaptive revealed a hierarchy of relationships between the factors that influence how stakeholders consider evidence (Fig. 16.2). Moving from the top to the bottom one encounters factors of increasing influence on how we perceive how our world works. Shallow analysis never goes beyond the tip of the iceberg, the events that periodically appear with no pattern that connects, and makes sense of them. Historians and statisticians might look deeper for those patterns that show us trends that brought us here or that suggest where we are going. Looking deeper one searches for the ways that we interact, the patterns of behavior, that create those trends. The network of such causal mechanisms is also referred to as the system structure. At the base are the most powerful forces that determine all the patterns above: the myths and paradigms we nurture or the goals that we as individuals or as members or an organization develop and follow. To summarize a vast and rapidly expanding field in applying cognitive psychology to management, one still must pursue rigorous science and technical implementation, but achieving mutual understanding of the science and policy based on very different goals and underlying paradigms is essential. Science only becomes useful as the different perspectives in any dispute come to agree on how to define the means to interpret and then implement science. The importance of goals and mental models to decision-making becomes clear if the AM cycle is expanded to try to account for the complexity of the policy world (Fig. 16.3). In the assessment phase, all factors in Fig. 16.2 are used to define the problem (usually as a trend) and the pattern of likely causes. From the outset this is complicated by the fact that the nature of the problem itself is in question. Problems may have multiple interpretations, based on conflicting values and goals (Weick 1995). Even if the basis of a problem is relatively simple and clear, the goals and mental models of individuals and of the surrounding culture and politics will dominate how it is defined and interpreted. This is because goals and mental models act like a filter that determines what information is selected and how it is measured in evaluating policy performance or in decisions as to how policy is implemented. One example of this is the physics of increasing the concentration of CO2 in the atmosphere, which is not complex. It can only cause more heat to be retained, and this reliably predicts why the years since 2000 have exhibited the hottest atmospheric temperatures ever measured. Yet many deny the evidence (that climate change exists at all) or the theory that society is driving it by generating more greenhouse gases. Political conservatives, who often ascribe to hierarchist or individualist paradigms, tend to deny climate change theory or evidence. Political liberals, who tend to subscribe to paradigms centered on community (communitarian) and social equality (egalitarian), tend to accept the science supporting climate change theory (Kahan 2008, 2013). However, both conservatives and liberals are equally likely to interpret data ideologically. There is a third, social and political, aspect involved. As Kahan (2013) concludes: “…ideologically motivated cognition …[is] a form of information processing that promotes individuals’ interests in forming and maintaining beliefs that signify their loyalty to important affinity groups.” Thus, while the perceived political and economic consequences of climate change are so unacceptable to political conservatives that they deny climate change and the science behind it, their public stance has much to do with being “in social solidarity” (sensu Thompson et al. 1990) with those subscribing to the same view. As previously stated, the assessment phase serves to define the management challenge and identify which factors may be involved in its genesis or in any solution(s). How factors are assessed depends both on mental models and goals held by individual stakeholders as well as the model(s) of the problem developed by the group. The process of building a model of the problem that is understandable and acceptable to the group offers a chance to clarify what goals and mental models are being used by individuals. If those are ignored, there is a good chance that efforts to reform policy or encourage the adoption of new innovative policies may be rejected by stakeholders. This highlights the importance of sustaining the learning process long enough to achieve such clarification. This deeper level of learning, e.g., double-loop learning, involves probing the decision-making process itself and how social and institutional relations and stakeholder perspectives influence it (Torbert et al. 2004; Argyris 1976, 2005; Argyris and Schön 1978; Williams 2011). Double-loop learning can enable shifts in underlying beliefs, values, and mental models. This stands in contrast to single-loop learning that improves policy performance through trial and error in implementation without reflecting on the whole system of feedbacks that influence decisions, policies, and performance. The expansion from single- to double-loop learning represents a major challenge of management modernization in education, business, and natural resource management over the past 50 years. This is reflected in similarities between AM and other learning cycles tested in the fields of education (Kolb) and business [Deming/Shewhart—(Deming 1986; Best and Neuhauser 2006)] (Table 16.1). The structure of the group model, e.g., the pattern of interactions, can be used in the assessment phase to identify feedbacks and other interaction patterns that are critical to the emergence of the problem. Changing, e.g., stopping, slowing, or speeding up, such patterns could therefore be part of a solution, so such group models can be used to identify critical points of intervention for management policies. Such models can also help identify what is not known about critical factors or patterns and thus help set a research agenda for long-term monitoring. Thus, the policy formulation phase uses these data and insights to devise strategies and policies that are used to guide the next two concurrent phases, e.g., policy implementation and monitoring. The latter is guided by a research agenda aimed to answer the critical questions and unknowns identified in the assessment. AM experiments over 40 years have revealed the diversity of factors that must be integrated to successfully manage adaptively. This has thrown a sharper light on what barriers can block it. Table 16.2 groups these barriers into the phases of the AM cycle which they impact. As discussed above, barriers in the assessment phase mostly revolve around failure to clarify conflicting values, goals, and perceptions. Two barriers emerge from rigidity of organizational structure, e.g., bias toward authority that only passes downward in a decision hierarchy (verticality) or bias toward one’s own working group that overrules the functioning of the whole (departmentalism). Barriers in the policy phase are mostly due to procedural failures in formulating policy, e.g., lack of transparency, failures to adequately address uncertainties or the science (lack of controlled experiments), often related to preferences for quick answers and fixes to the problem rather than profound learning and better understanding. Barriers in the action phase revolve around execution, either overall (implementation failure) or due to confounding feedbacks that reverse initial success and scuttle any attempts to improve or revise a strategy (policy resistance). One particular barrier that may be common to more than one phase is “gaming the system,” i.e., gaining personal advantage by manipulating or exploiting the governing rules that were originally designed to protect everyone. This can block mutual efforts to assess, formulate policy, act, or monitor. Finally, the monitoring and evaluation phase is blocked by barriers similar to those that block perception and understanding in the assessment phase, e.g., selective perception, ambiguity, bias, etc. Broad stakeholder participation across scales, disciplines, and sectors (IWRM and AM) promotes adaptive capacity by diversifying the knowledge base (skills and experience) and sharing it within and across networks. Navigating better through institutional (policy, law) complexity by fostering better information sharing through networks. Improving the cohesion between policy formulation and implementation by basing monitoring and policy application on hydrological boundaries (IWRM). Supporting water security in the face of climate variability by offering platforms to share values and complex information so as to resolve conflicts and encourage innovative experiments. The resilience of a social-ecological system (SES) in the face of uncertainty arises not only from flexibility and adaptability but also from reliable stability during stress or turbulence. Environmental law is a legal buttress that provides a measure of certainty in the institutions that it formalizes in legislative and administrative code. But that investment in stability can encourage an institutional rigidity that hinders efforts to flex, innovate, and develop novel management strategies to probe a shifting environment (Benson and Garmestani 2011; Allen et al. 2011). This rigidity can be reinforced if the information gathered in the legislative and lobbying process loses its diversity as it is filtered and synthesized through a small minority of individual politicians. The possibility for innovative experimentation is cut off if the legislative process is only informed by small networks of technocrats who exclusively share a vocabulary narrowed by their common experience. This path dependence on technocratic elites was one impetus for the search to expand the range of perspectives, experience, and training that informed the policy debate (Gunderson et al. 1995) driving the move toward interdisciplinary and transdisciplinary dialogue in decision-making. Therefore, though in the European Union AM for water resources has been institutionalized within the WFD with a 6-year management cycles (EU 2016), each new cycle should begin by recognizing the danger of path dependence on a technocratic elite and search for a sufficiently wide range of perspectives across society. That search seeks to increase our capacity to adapt to change by expanding beyond management to governance in general. Managing aquatic SES proceeds over time scales (decades) that far exceed those of individual science or development projects or individual management campaigns within political administrations. To make SES sustainable, the adaptive potential raised by AM must be sustained over periods long enough to institutionalize adaptive and sustainable practices. This drive to build long-term SES sustainability proposed adaptive governance as a framework that would foster AM while addressing social aspects neglected in initial AM experiments (Allen and Gunderson 2011). Specifically, it should create a workspace where formal and informal institutions can collaborate to understand and manage complex issues in SES (Schultz et al. 2015). Adaptive governance is distinguished by its capacity to increase the importance of learning at the policy level and to bridge previously separate levels: formal/informal groups and networks as well as scales of administration (polycentricity), in ways that embrace cross-scale interactions in ecosystems and society (Chaffin et al. 2014). By encouraging social learning, e.g., learning that occurs in a group as a whole when collaboration involves developing shared understanding of meanings and practices, it is easier to resolve conflicts dealing with differences in perspective and community acceptance to implement and sustain innovative management approaches (Huntjens et al. 2011). Learning can also be enhanced among those who devise and implement policy through policy learning, e.g., a discursive process that challenges assumptions and goals of policies and thereby develops cognitive frameworks to revise the goals, techniques, and policies (Pahl-Wostl et al. 2007). The degree to which a riverine SES becomes more adaptive to change depends on what level of policy learning it attains (Argyris 2005; Hargrove 2002; Sanderson 2002). In sum, learning should be encouraged for all actors in all phases of the adaptive cycle. Efforts to make governance more adaptive must be concerted enough to enjoin administrative agencies, which are prone to make small, slow, incremental changes (Allen et al. 2011), to contribute to much more comprehensive policy reform. Two deficiencies often make agencies default to an organizational inertia (Allen et al. 2011) or path dependence that does not stray from standard operating procedures: a lack of sufficient information to radically reform policy and a lack of institutions that fit the scale at which problems occur (Dietz et al. 2003). Adaptive governance can address these deficiencies by incorporating the perspectives of different stakeholders working at multiple scales, e.g., local, river reach, basin, and regional (Hughes et al. 2005). Such multi-scale collaboration, enhanced by bridging organizations, improves environmental management by facilitating the creation (governance) and actualization (management) of visions that are ambitious and innovative (Folke et al. 2005). Bridging organizations, often NGOs, enhance policy acceptance by improving stakeholder perceptions of data collected and decisions reached through establishing communication channels and negotiating the meaning of the information as well as the multiple positions and interpretations with stakeholders. This builds trust that increases chances for collaboration and reduces transactions costs while providing means to enforce adherence to policies even in the absence of a regulatory authority (see Chap. 22). Such informal collaboration builds trust and understanding through sharing management power as well as its responsibilities. Trust is an essential ingredient to making governance more cost-effective (Hahn et al. 2006). It stimulates and consolidates coordination and interaction between different actors from different domains and organizations in the water governance networks. With higher trust actors invest their resources, e.g., money and knowledge, in cross-disciplinary collaborative processes. Therefore, it stimulates experimentation and learning (Edelenbos and van Meerkerk 2015). These benefits are best realized in two ways. First is with the help of boundary spanners to cut across divides that fragment institutions. Such individuals create informal spaces for innovation that connects people operating at other domains, levels, scales, and organizations. Secondly, trust and collaboration can be gained by integrating support from the top (visionary leadership) with inputs from each scale or level. The chances of successful transition to adaptive governance are increased by AM-friendly legislation, sufficient funding, and a dependable stream of useful information from a diversity of sources, e.g., both ecosystem monitoring and participatory discussion (Olsson et al. 2004). Adaptive governance recognizes the unique contributions to all these functions played by innovative social networks. For example, networks act as a bridge, communicating between the variable and unpredictable realms of ecosystems and the more rigid, formal realms of institutions and policy (Folke et al. 2005). Such social networks can be more successful than conventional institutions in government and business at generating political, financial, and legal support for innovative policies (Folke et al. 2005). Success often hinges on visionary leadership to direct the collaborative common of the network (see Allen et al. 2011 for more detailed discussion). Two challenges confront anyone leading an AM process: the threat of harm from the ongoing problem and the chance that the entire process is halted for any of range of reasons why society often defaults to conventional practices rather than innovates (Sect. 16.3). As a result, even river managers who attempt adaptive governance are cautious. For this reason, most AM experiments have been “passive” in that they implement a single preferred course of action based on the best available modeling and planning, which is then modified as experience grows (Benson and Garmestani 2011). Passive AM relies on nature to provide the variability within which different policy options are tested. In some cases passive monitoring of how the world changes may not generate clear and reliable knowledge within a time frame useful to make or implement policy. Under those circumstances, decision-makers within an AM process may seek to intervene with a policy that stimulates the system and thereby learn from how the system varies in response. Here policy options are seen not as solutions but as hypotheses to be tested under a regime where formalized learning and management are objectives for which experimentation is the key (Rist et al. 2013). Interventions can be risky, especially in riverine SES, which are “…open systems that cannot be isolated from their social context” (Konrad et al. 2011). However, some river managers do choose to actively intervene in response to some emerging problem. Often a lack of data challenges managers trying to understand and manage how environmental flows contribute to the serviceable functioning of a river. A history of water control structure construction has almost eliminated naturally flowing rivers. In North America construction of more than 2.5 million control structures have left less than 2% of all rivers naturally flowing (Lytle and Poff 2004), with a similarly small percentage of naturally flowing rivers in Europe (see Chap. 6). This denies most managers naturally occurring reference flow conditions to use as performance criteria. Social awareness of this extreme state has been heightened by the growing recognition of society’s dependence on increasingly fragile aquatic resources. Many rivers are stressed and over-allocated in order to serve the demands of growing populations through hydro-engineering (Chen et al. 2015). In response, societal values have shifted to question this history, and managers have been compelled to modify operations of these control structures to mitigate physical and biological impacts on aquatic ecosystems (Rood et al. 2003). As previously noted, the versions of AM briefly outlined above are basic templates that describe an idealized sequence of events. While no case of AM has ever strictly followed such a template, one can use them to design a new project or to roughly follow the “progress” of each AM experiment. For example, in Colorado a number of experimental interventions in dam water releases to test different river flow volumes and rates were attempted before an AM process was officially started. After an environmental Impact Statement in 1995, the river managing agencies elected to formally adopt an AM program in order to better harmonize conflicting goals related to water use, recreation, and protection of native species (Walters et al. 2000). This means that the AM assessment phase began after a period of management interventions and monitoring. Following initial assessment, policies to experimentally manipulate river flows were formulated and implemented. The most celebrated was the release of a large “beach/habitat-building flow” (BHBF) in 1996 to assess whether episodic flows could move sand from the main river channel onto lateral deposits on riverine “beaches” used for camping and thereby “reverse successional impacts on the productivity of backwater/slough habitats” (Walters et al. 2000). By 1997, management elected to boost the assessment process through development of explicit dynamic simulation models of the Colorado River ecosystem. This was done to support future adaptive planning, not through “detailed quantitative predictions about policy options, but rather… to expose broad gaps in data and understanding that are easily overlooked in verbal and qualitative assessments” (Walters et al. 2000). In 1998 the assessment phase proceeded through a series of workshops dedicated to develop an ecosystem model and a family of submodels with participation of up to 40 scientists and managers working within the Colorado River system. This phase concluded with a final meeting to critically review the model to identify key gaps and weaknesses both in the model and the data (Walters et al. 2000). One conclusion reached by the group modeling exercise was that extreme policy options, e.g., restoring seasonal flows and increasing water temperatures, could produce highly uncertain, potentially deleterious effects with no unquestionable benefits. This may be one reason why more extreme experiments, e.g., BHBF, have rarely been repeated. But flow experiments have continued as part of long-term monitoring over the past 20 years. Complete return to natural flow dynamics was impossible, but an array of simultaneous experiments in flow modification were implemented to address a range of problems: conserve shoreline sandbars and fish, improve navigation (modified low fluctuating flows), and rebuild sandbars with tributary sand inputs below dam (high flow experiments), to warm the river, to benefit juvenile humpback chub (high steady flows and low summer steady flows and fall steady flows), and to limit rainbow trout egg viability (trout management flows) (Melis et al. 2015). Such strong interventions can produce dramatic results that reveal threshold effects. But they only start a learning process that must be sustained over years of monitoring to discover policies robust to system dynamics over both the short and long terms. While the initial high-flow experiments on the Colorado River generated a surprising amount of riparian beach building (53% of all beaches increased in size (Poff et al. 1997), these beaches and sandbars were eventually eroded by fluctuating flows from hydro-peaking (Schmidt and Grams 2011). Furthermore, if other aspects of serial discontinuity (lotic habitat fragmentation, thermal regime changes, sediment supply reduction, biota migration disruptions) are involved, then experimental manipulations of flow may not be sufficient for learning or treatment (Lytle and Poff 2004). Experiments in natural flow simulation occur now worldwide to reestablish the ecological integrity of regulated rivers (Lytle and Poff 2004). Robinson and Uehlinger (2008) note that “As a large-scale disturbance, the long-term sequential use of floods provides an excellent empirical approach to examine ecosystem regime shifts in rivers.” The Sustainable Rivers Project is a North American example of a program of experimental interventions to reestablish environmental flows by “re-operationalizing” dams at some six sites covering over 1000 km of river (Warner et al. 2014). Challenges to sustainability occur under a multitude of circumstances, and no single approach to adaptability fits every circumstance. Experience since 1975 suggests a number of circumstances where AM is not likely to succeed. These include low uncertainty about what policies to apply and what outcomes are likely and low probability of carrying out an effective monitoring program or of feeding monitoring data and its analysis back into the reformulation of management strategy (Williams 2011). Unfortunately, many political regimes have election cycles so short (less than 4 years) that long-term monitoring is hard to secure as a policy standard before a new regime is installed. For those situations where resource variation does not respond to management actions, e.g., climate change, then controllability is low, and AM is not appropriate (Fig. 16.4). Challenges occurring at very large, e.g., global, scales with very slow response times are examples of low controllability. However, for such situations AM might be useful for managers if it can help explore and mitigate some of the impacts that occur at scales responsive to management actions. Otherwise, situations of low controllability but high uncertainty might respond best to scenario development (Peterson et al. 2003). Scenarios can be developed which simply outline a sequence of actions and events required to attain some goal. While generally more qualitative than quantitative, under high uncertainty, they can help improve policy implementation if management teams can use them to agree on what they expect and how they will respond given different outcomes. On the other hand, if there is little uncertainty about the response of resources to management policy, then AM’s capacity to experimentally compare different policies is wasted (Allen et al. 2011). For example, in fisheries where rigorous monitoring yields very reliable fish population data, managers might aim to achieve maximum sustainable yield, i.e., the largest yield or catch that can sustainably be taken from a population over an indefinite period. Historic applications of MSY have generally set it around 30% of unexploited population size (Thorpe et al. 2015). Alternatively, with low uncertainty but also low controllability, there is not much chance to intervene precisely. Therefore, the optimum strategy might be to implement policies that increase the resilience of aquatic species to disturbance. For example, with little possibility to influence drought cycles, general restoration of floodplain habitat and reconnection hydraulically to the river channel can increase opportunities to find shelter, food, and chances to reproduce. In this way aquatic species have more capacity to adapt to extremes in rainfall patterns. In summary, adaptive management will not reassure political regimes that demand only easy answers. It pushes in the opposite direction by exploring exactly what the uncertainties are and how to probe them. This push lowers the chance of falling into traps where dependence on certainty makes policies inflexible to change. AM has higher chances of succeeding where uncertainty may be high but so is controllability, so the chances for experimental learning are high. That means that AM is more appropriate where uncertainty is high, e.g., little is known about the scales at which problems emerge, but where management actions can produce clear and definitive impacts. Chances of AM success improve in situations with lower uncertainty, e.g., simple systems with data clearly indicating causal relationships, and policies can be implemented at small scales with clear effect, e.g., controllability, to test hypothetical causal relationships (Gregory et al. 2006).